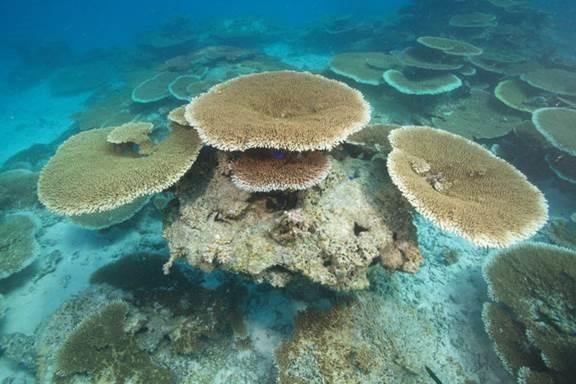 More Evidence of Coral Reef Resilience! | Watts Up With That? In my essay, The Coral Bleaching Debate: Is Bleaching the Legacy of a Marvelous Adaptation Mechanism or A Prelude to Extirpation? I presented evidence from a synthesis of the most recent peer reviewed science that demonstrated coral reefs can be very resilient and the gloom and doom claim of climate alarmist Hoegh-Guldberg that “as much as 95% [of the world’s coral] may be in danger of being lost by mid-century.” is most likely biased fear mongering. The literature review suggested coral should be very resilient to climate change because: 1) Coral had previoously adapted to warmer ocean waters than they now experience in the present and survived more frequent El Ninos over the past 6000 years. 2) Storms render the greatest mortality but coral quickly recover via “re-sheeting” also known as the Phoenix effect. 3) Coral adapt rapidly to climate change by shifting and shuffling their symbionts, acquiring new symbionts better adapted to the new conditions. 4) Much like trees and shrubs devastated by a fire, where new growth from protected buds can relatively quickly restore the forest; likewise coral can rebound from “cryptic polyps”. While the Australian reported a balanced article comparing Hoegh-Guldberg’s gloom and doom to my more optimistic interpretations, the Australian Broadcasting Company’s Media Watch decided despite all the evidence for a more optimistic outlook, such an interpretation needed to be attacked. To protect Hoegh-Guldberg’s more catastrophic illusions, they dismissed my analyses, NOT with evidence, but via a “shoot the messenger” tactic. (Media Watch’s tactics were demolished here.) But now, as before, researchers are re-visiting what they thought were previously “dead reefs”, and they continue to find coral reefs are indeed highly resilient. A recent NY Times article Coral Reef in Protected Area Shows New Signs of Life discusses the unpredicted rebound of Kiribati’s Phoenix Islands reef and Coral Castles. A similar long-term study in the Maldives observed a dramatic loss of coral during the 1998 El Nino but by 2013 the reefs also had returned to “pre-bleaching values”. Such resilience is exactly what the adaptive bleaching hypothesis would predict. Corals are a very old and very diverse group, so I doubt any real fragility due to temperature changes. It appears that we have learned some real facts from the CAGW premise . . we do not know much for sure. But Mann says that there is nothing to study anymore. He/we know it all, just look around. LMMFAO at him! Sorry bout that! Greenies and lefties ALWAYS underestimate nature’s resilience. Coral isn’t plugged into the zietgiest. Wouldn’t it be helpful if more scientists unplugged themselves as well. German for “spirit of the times”, literally “timespirit”. “Geist” is cognate with “ghost” and “zeit” with “time”. German Z is pronounced “ts”. BTW: Isn’t it funny that there is no English word for such an important thing which ruling – no less – than the course of history??? The reversed e and i, which in German makes a big difference in pronunciation. In English, we have to say “spirit of the times” rather than a simple two syllable compound word. May be we need to plug in the coral. The demise of Australia’s Great Barrier Reef is predicted every year by alarmist dependent on taxpayer funds while reef tour operators and other professionals show the reef in good condition. The Australian governments who do everyone a favour if they installed web cams throughout the reef anyone and every could observe the sites 24/7 and build video record for the future. If life on earth were not extraordinary resilient and adaptable, we would not be here now – although we should never be willfully negligent or complacent. What disgusts me about the CAGW movement is the massive waste/diversion of resources from other really important conservation/environmental/pollution problems. Anyone catch that twit on KGO a couple of nights ago? I think she was channeling the late Dakota James (“Greenhouse! It WILL happen in 1997”). According to her the GBR is nearly dead, with no hope, endless warm blobs are being circulated in the oceans, there is a YUGE N. Pacific die off of all flora and fauna … etc, etc. This was warmista speak on steroids. I couldn’t believe it, it was so over the top. I read Jim Steele’s “The Coral Bleaching Debate: Is Bleaching the Legacy of a Marvelous Adaptation Mechanism or A Prelude to Extirpation?”. It is very worth reading. It makes clear that ‘bleaching’ is nothing alarming at all: it is just part of a well tuned process of adaptation to the ever changing circumstances in the oceans: think about changing winds, clouds/sun, currents, temperature, El Nino’s, upwellings yes/no and availability of nutrients and so on. WITHOUT ‘bleaching’ as a way of adaptation, corals would die. Just because of bleaching they don’t! Have just received a copy of this book, being one of the lucky ones of the recent promotion. Much appreciated and my thanks to the author and WUWT. Corals are partially responsible for a planetary drop in CO2 levels to a point where terrestrial plants cannot survive. If mankind were to set for itself a mission to exterminate the corals to protect the CO2 balance, it would find the mission impossible. Kill corals in one location, they pop up somewhere else, Whack-A-mole fashion. Corals share attributes with polar bears. They are dramatic, exotic, and the average person knows next to nothing about them. Therefor they are perfect fodder for alarmist scare campaigns. 1) Has it been proven that the pH of the ocean has actually changed? 2) Has it been demonstrated that 13 to 18µ IR can warm water? 3) How did Coral handle the Little Ice Age, Roman and Minoan Warming? 4) Will the alarmists face any consequences for their exaggerated and epically wrong conclusions? Of course NOT as long the alarmists rule over the MSM and therefore over most politicians. Thus they can manipulate inconvenient facts away as e.g. their coral-extinction fear mongering discussed here. And don’t forget their unscrupulous willingness to “adjust” all real data until it fits their doom and gloom stories. Unless the globe will suffer under a strong cooling of a new great ice age, the alarmists will be quite able to vilify CO2 – the very base of Life itself – still further. And even then I expect them to blame CO2 for such a cooling by some trick. They are running to keep the government out of your wallet and out of you bedroom. I will not be wasting my vote on Clinton or Trump. It’s time to fix this country’s duopoly. It will never be easier to fix than this election cycle. I rather vehemently disagree on the ploy of voting third party in the US. Perot ran to the right of GHW Bush, and his supporters de facto elected Bill Clinton. Nader ran to the left of Gore, and his supporters in Florida de facto elected GW Bush. Unless Mr Restin believes that this time it is the Revolution, third party voters do not get what they puportedly want. This time, voting for Johnson is voting for Hillary Clinton by very high odds. 1. Yes, by 0.1 in barren oceans. No, in any fertile oceans. Essay Shell Games has details. 2. No. It is a complete misunderstqnding of how GHE works. Incoming SWR warms, including oceans. Outgoing LWR cools. Defracted outgoing LWR only fails ro cool, fo a first approximation concerning surface evaporation and micron thick boundary layers. 3. Just fine, or they would not be here now. 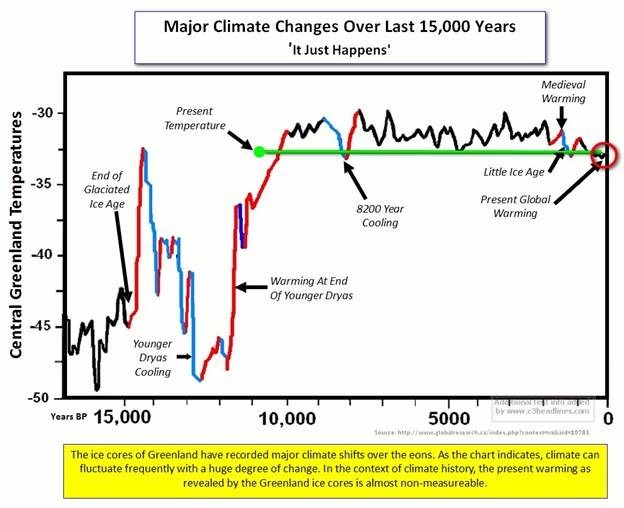 How did the coar we presently have make it through the warm period as shown on this graph? It is also my understanding that there are millions of years of coral deposits. So how did the coral make it through the thousands of years of cold temperatures preceding the warmer period? The warmer intervals of the Holocene aren’t a pimple of the posterior of the remarkably hot ocean temperatures of the more distant past, during which modern corals lived, such as the mid-Cretaceous and PETM. Make that pimple on, not of. Cretaceous tropic SST could have been higher than 36 degrees C.
All the scientific evidence to the contrary is false and requires ‘adjustment’ to align with the computer models, since computer models are the ONLY real truth. How deep are these coral reefs? Is the water warming at those depths? Much more significant damage is caused by destructive fishing, agricultural runoff and other pollution, and sediment runoff from coastal development. These are serious threats to these ecosystems and the focus on climate change distracts from resolution of these problems. Filth from favelas and slums does them no good. Agree. Greatest reef threats are pollution and overfishing. Pollution smothers and also directly kills via H2S toxin from organic decomposition. Overfishing kills by removing ‘symbionic’ fish that graze smothering algae and seaweed. We have both problems on the largest US continental reef here off South Florida at Fort Lauderdale, where I dive that very reef. Three sections, shallow, mid, and deep, starting just about 500 meters off my home. We are on the 12th floor, so see the shallowest reef easily every afternoon. Blue turns green. With high swells, they always break over that reef in huge white waves. So once again, Australians will be the last ones to get real story. Global warming could do at least as much to protect the world’s coral reefs as it will to damage them, new research from Australia suggests. Good news to hear. I have Australian friends who were in Queensland a few weeks ago, diving on the reef. They saw and/or heard about bleaching. It was obviously upsetting for them as the GBR is a national treasure. I will forward these articles and hopefully calm their fears. And maybe gain some readers. Wdn’t surprise me if Eco-Guides trip the snorkellers & divers out to bleached reefs, and ignore the live ones. Anything to perpetuate the Doom & Gloom AGW Message. Just like my buddies on an Alaskan cruise who were brow-beaten by AGW-Guides who drove home persistently that the calving of glaciers is due only to AGW, and nothing to do with the time-immemorial river of ice moving down to the ocean. If there’s any change in nature, it’s due to AGW of course, and nothing to do with other factors! Jim Steele and other scientists who post here for our benefit deserve our gratitude. Thank you for keeping the candle lit. Yes, Thank you for an interesting article, as always. Presumed dead. Presumed extinct. Prophecies in time and space. Science is an endangered philosophy. Maybe mans ego will not allow them to see that earths climate cycles are longer than our total existence on the earth? So, how can we expect to observe from fossils and ice cores what has been occurring for billions of years? Silly humans. A coral bleaching event would also tend to rid the reef of reef predators like the infamous crown of thorns. Might bleaching also be, in part, an adaptive mechanism to achieve precisely that goal? Maybe there is a lot more to “bleaching” than has been assumed so far . If climate alarmist Hoegh-Guldberg believes that “as much as 95% [of the world’s coral] may be in danger of being lost by mid-century,” is there a danger that he might be inclined to make sure the reefs he studies are constantly “disturbed” to make his prediction more likely? I just hope he is one scientist whose love of science and nature is bigger than his ego. Coral reef ecologist Jeremy Jackson explains that restoring PARROTFISH populations and improving other management strategies, such as protection from overfishing and excessive coastal pollution, could help the reefs recover and make them more resilient to future climate change impacts. That is tragic. Nonsense about global warming distracts from real solutions. With friends like environmentalist s the earth doesn’t need enemies. What a misapplication of resources. I don’t think of environmentalists as a monolithic group, CO2isLife, and many are probably good scientists who care deeply about the ecosystems of the earth . . But some are just fakes and shills it seems, who give the profession a bad name. Thing is, the good ones better start speaking up, as Mr. Steele here has, about the overblown resources black hole of climb it change . . and damn the torpedoes. Political History is full of “Campaign-Seizing” initiatives likely to catch the popular imagination … the large majority (80%)?) of whom lack even a basic understanding of the scientific, environmental & economic issues, yet have a vote!!!! *If* there’s an ‘Environmental card-to-be-played’ in the competition between candidates to advantage, it will be played! If Clinton sees that she can squeeeeze an extra vote out of AGW, she will ‘play-to-it’. If Clinton prevails, our only hope is that Common Sense will ultimately prevail and AGW — as a God-sent Mission in the election campaign — will be relegated to the realities — like keeping the lights & heating on in mid-winter Chicago for Grannies who can’t afford the astronomic electricity bills ‘cos some previous Moron blacked-out coal-fired energy, nuked nuclear expansion, and invested in expensive energy at the taxpayers’ expense. Jim Steele, WUWT – great. Coral reef resistance is seen at Bikini Atoll. After the coral was vaporized at 50,000 degrees by nuclear bomb and three islands wiped off the face of the earth back in the early 1950s. The coral has grown back and is now in pristine condition and growing like a forest. Jim. I’m in no way shape or form a biologist, but the whole coral reef thing seems to me to be terribly ad hoc and lacking in rigor. If the seas were to warm substantially, wouldn’t the coral reefs and their ecosystems expand poleward? And how about corals in the Red Sea? Don’t they do pretty well in often substantially elevated temperatures–34C? e.g. http://www.coral-reef-info.com/red-sea-coral-reefs.html And what does X% bleaching mean really? Does it mean that a large, randomly selected, area of reef surface was gridded and compared to recent photos and X% of the area was bleached? Or does it mean that someone looked around and made an estimate? Are there areas of coral that have been dead for centuries that are counted as bleached? etc, etc, etc. 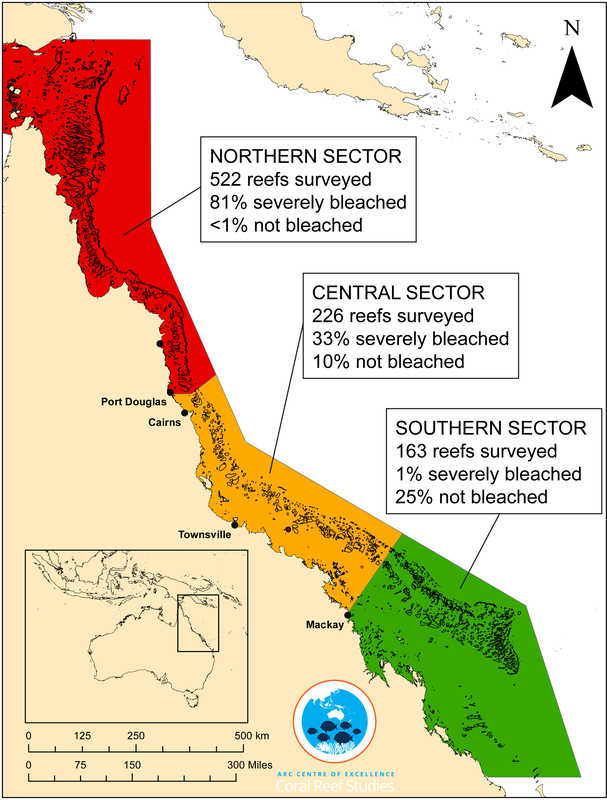 I still believe that there is more to ‘coral bleaching’ in the GBR than is being considered. If it was simply a temperature issue, I would expect the bleaching to align closely with isotherms. Instead the southern part of the GBR seems little affected, as does the northernmost (warmest!) end, and the most heavily affected areas are also (coincidentally?, I think not) bathed by the current that crosses the Coral Sea from the gap between Vanuatu and the Solomon Islands – a VERY active seismic area, especially along the South Solomon Trench. Anything being injected into the sea at this location (such as volcanic acids, heavy metals, etc.) would be carried by the currents directly to the GBR. The Anthozoa were practically wiped out in the Permian-Triassic mass extinction event, aka “The Great Dying”, but the modern coral orders promptly evolved in the wake of this “Mother of All MEEs”, 252 million years ago. And of course also survived the two previous (Ordovician-Silurian and Late Devonian) and two subsequent (Triassic-Jurassic and Cretaceous-Paleogene) MEEs during their at least 570 million-year history. The Devonian extinction hit reef-building organisms hard, which at that time included corals. It’s also associated with the evolution of tetrapods, ie creatures like us, with four limbs, from our lobe-fin fish ancestors. In the end-Cretaceous event, along with almost all the large vertebrates, on land, at sea and in the air (ie, all dinosaurs, plesiosaurs, mosasaurs, and pterosaurs, but not all crocodilians), most plankton and many tropical invertebrates, especially reef-dwellers, suddenly became extinct. Many land plants were also hammered hard. His [Prof Ridd] suggestion is backed up by an Australian Institute of Marine Science research team headed by veteran reef scientist Ray Berkelmans, which has documented astonishing levels of recovery on the Keppel outcrops devastated by bleaching in 2006. “…As The Weekend Australian reports today, some of the corals on the Keppel outcrops are more thickly covered in coral than before bleaching in 2006, raising hope the living heart of the reef can acclimatise to spikes in water temperature through a remarkable process of algal shuffling. “That was a real surprise,” Dr Berkelmans said, conducting us on an underwater tour of what he calls his “lab rat” reefs at the bottom of the Great Barrier Reef. 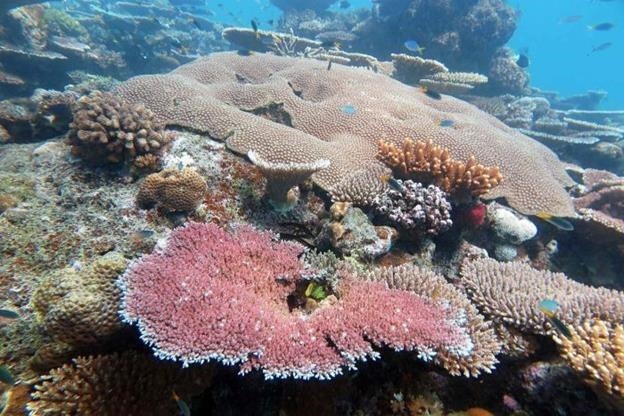 He said the findings made him more optimistic about the ability of corals to adapt to climate change, especially on inshore reefs such as those in the Keppels. “People say the reef is dying,” Dr Berkelmans said. “The Great Barrier Reef is 2000km long, with 3000 reefs. Are you telling me all of it is going to die? Just look at the geologic record. Coral has been around for 500 million years. One coral extinction was blamed on FALLING CO2 levels. That isn’t a joke.